Free Shipping Included! TSM Products Round Polish Fermenting Crock with Stone Weights, 10 L, Burnt Sienna by TSM Products at Three Guys Pies. MPN: 37072. Hurry! Limited time offer. Offer valid only while supplies last. The TSM Products 10L Polish fermentation pot is the ideal crock for pickling and fermenting your favorite market or garden fresh vegetables. The TSM Products 10L Polish fermentation pot is the ideal crock for pickling and fermenting your favorite market or garden fresh vegetables. 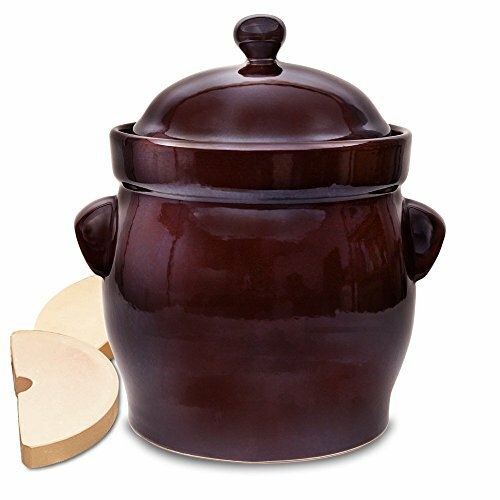 Available in a new design and attractive new color, Burnt Sienna, this fermenting crock is ideal for making healthy and delicious probiotic enriched, fermented sauerkraut, kimchi, cucumbers plus more of your favorite vegetables. Handcrafted in Poland from the region's vast natural clay reserves, this crock is designed for long term food storage in a natural environment, without the use of preservatives. The new design features a large, deep water channel to create an oxygen-free environment inside the crock. Fermenting gases, or carbon dioxide, are released while oxygen is forced out to create an airtight seal. A wide, 5" diameter opening makes it easy to load and unload your vegetable ferments and the crock's large handles are convenient for safe lifting and moving. Stone weights are also included for keeping vegetables underneath their brine or fermenting liquid. The 5L size is excellent for experimenting with smaller batches to create a wide variety of vegetable ferments. If you have any questions about this product by TSM Products, contact us by completing and submitting the form below. If you are looking for a specif part number, please include it with your message.